Its that time of year again! We are collecting handmade holiday cards for the residents of the Old Soldiers Home/ Armed Forces Retirement home here in DC. If you know an adult, office, child, daycare, or school that would be interested in making holiday cards to bring some joy to these individuals who have spent years or a lifetime in service to all of us, please spread the word and help us hand out a card to every retired soldier we can this holiday season. 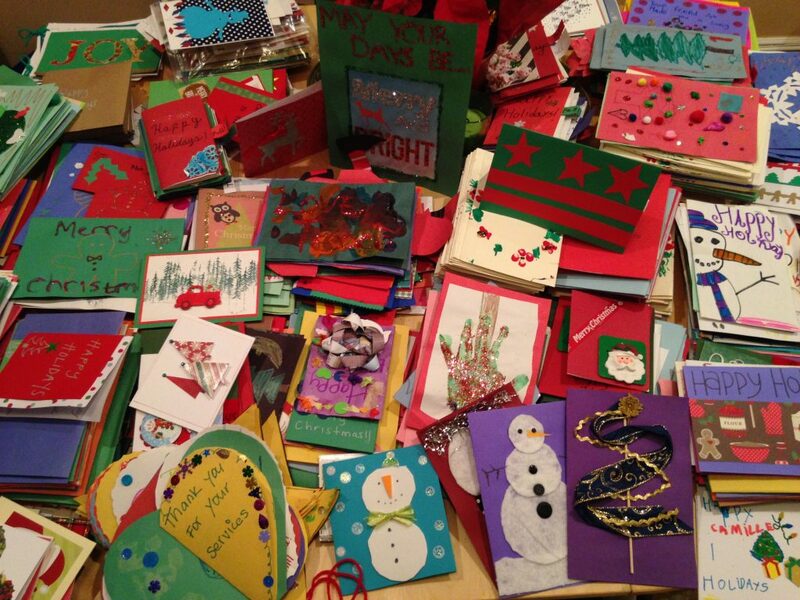 Last year we handed out over 600 hugely appreciated holiday cards from all over the country. The cards are delivered along with some hugs, singing and lots of holiday cheer. I will be happy to pick up the cards you make or you may mail/ drop them at my home. The deadline for this small but meaningful way to help experience the joy of giving back in our own backyard is Friday, December 15th. In the event the number of cards exceeds the number of residents, all of the remaining art will be shipped to operation gratitude for placement in care packages of persons serving overseas. Please help spread the word and lets make this years card drive a success!